All nutritionists know, that steamed or lightly fried chicken breast is one of the most healthy meals. White meat with minimal fat content: it is easy to quickly eat, but to get better from it almost unreal! It would seem the perfect solution for all those who are watching a figure and power! But we are so used to the fact that healthy means tasteless that sometimes refuse to diet Breasts in favor of friends from childhood, roasted chicken legs! Is it not possible to cook chicken breast so that it was juicy, tasty and at the same time do not lose their useful properties? Of course, you can! The main thing to consider when cooking a few subtleties of the secrets that make a person who knows how to cook a true chef! garlic and herbs to taste. pepper - to taste;100 ml low-fat yogurt; 2 - 3 oranges. Spices - optional. One of the ways to combat dryness of chicken breast – soy sauce. Soak in it the chicken should be already split, the best pre-cut the breast into two to four pieces, so all the meat is well soaked with sauce. Leave the sauce on the chicken should be 5 - 10 minutes not forgetting to stir! If You don't want to cut the chicken breast, leave it whole in the sauce, considering, however, that the time of soaking will be about double compared to the sliced breast. After marinating the chicken, you can add garlic or spices to taste and proceed to the fire or the frying. As for the salt, it should not be put, because after "swimming" in sauce chicken already acquire a nice salty flavor. For those who don't like soy sauce, you can offer to replace it with the lemon marinade. For its preparation will need 1 lemon, a couple cloves of garlic, salt, pepper, onion and herbs to taste. Carve the chicken, cut, salt - pepper, and put in a deep plate or bowl. On top sprinkle with grass, finely sliced or grated garlic, lemon, divide into several parts and also put in a bowl with the chicken. Cover with a chicken dish or a tight lid to form the juice. Leave the chicken in the marinade at least 30 minutes. If time is running out, the lemon juice, you can just pour the chicken just before cooking. The fact that lemon juice in conjunction with hot oil, forms a kind of film – a protective coating on the meat, not allowing it to drain the natural juice from the chicken. So the breast and it turns out especially tender and juicy, with a pleasant fresh scent! If You want something special, you can bake chicken Breasts in the oven, with delicate shading and oranges that will add new notes of chicken meat. So, let's cut the breast and put them on a baking sheet greased with a thin layer of butter. Now to the fun part - casting! Without it: the dish is not a dish! Whisk egg whites until frothy, adding to the resulting mass teaspoon of lemon juice and a pinch of salt. Separately, prepare the second part of the fill - mix the juice and pulp of one orange with low-fat yogurt. Then mix well all the ingredients. The chicken thickly daubed the resulting fill and bake at a temperature of 200C for about 10, maximum 20 minutes. Then reduce the temperature to 150C, and on top of the meat put the pre-peeled and evenly sliced slices of two oranges. You can also sprinkle the chicken with your favorite seasonings and left to languish in the oven for about ten minutes. You can also add in the marinade for the chicken a couple of teaspoons of red wine and/or sweet and sour sauce for a special, slightly tart flavor! Many people complain that they did not manage to cook a tender and juicy chicken Breasts. The meat turns out dry and tough. So one of the main advantages of this part chicken fat turns into a significant drawback. 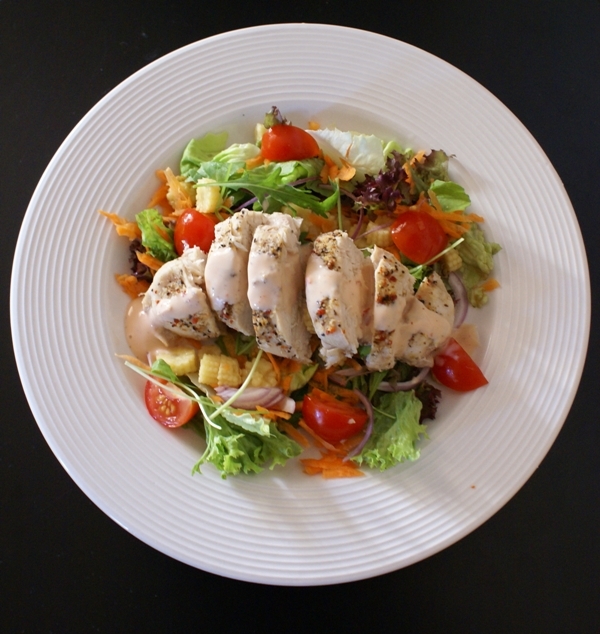 It is precisely because of this delicate and diet chicken Breasts so just "dry up". But do not despair, ways to keep chicken breast tender and juicy so much that everyone will find a recipe that suits him. Culinary techniques to maintain the juiciness of chicken Breasts, a great many. Here are some of them: "sealed" followed by baking, pre-marinating, breading, cooking Breasts in foil. Let's consider the most simple and popular. Mix in a bowl olive oil, salt, pepper and dry or fresh chopped herbs. 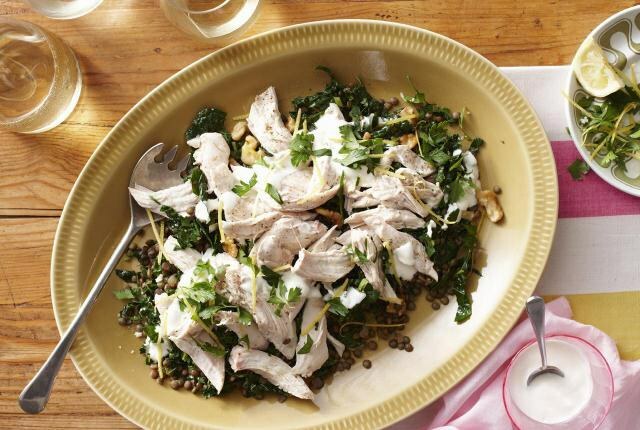 You can also add a spoonful of wholegrain mustard to make the chicken more savory taste. Coat chicken with mixture of oil and seasonings. Wrap the breast in foil. Pay special attention to the "package" of foil was tight and without gaps. Bake the chicken for 30-40 minutes, depending on the weight of the fillet. You'll have a fragrant, juicy and light. This recipe uses another great cooking technique – pre-salting chicken meat. Dissolve sea salt in warm, in any case, not in hot water. Put the Breasts in a brine bath at least half an hour, to a maximum of 45 minutes. Thus they are evenly salted and will be juicier. Peel the almonds and finely chop it, mix in a wide bowl or plate with high sides with bread crumbs. Whisk the egg with a fork, add the zest and pepper. Do not add salt, as the almonds are already salted! In a thick-walled skillet, heat the oil. Reduce heat to medium. Dry breast, whisk and flour. Dip turns Breasts into the egg mixture and then into nut-bread breaded. Fry the chicken in hot oil for 5-7 minutes on each side. Do not cover the dish with a lid, otherwise the breading will get soggy from the accumulated steam and start to fall off. Chicken Breasts lightly beat off and marinate. For the marinade in a bowl, combine lemon juice, oil, garlic, pepper, parsley. If you get juice from a fresh lemon, before you squeeze it, send a citrus half a minute in the microwave. So it will flow out more juice. Breasts in the marinade, cover with a lid or foil and send it for half an hour in the refrigerator. Marinated breast you can just quickly fry in a dry non-stick pan for 2-3 minutes on each side or bake on the grill. We intentionally do not is a popular recipe for chicken Breasts baked in bacon with herbs, as this dish is not diet. But delicious. But even tastier it will be, if you cut in the chicken breast "pocket" and put in it soft cheese with herbs. White chicken meat called chicken breast, is a diet product, it contains almost no fat, but is present in large quantities animal protein and many other nutrients. Especially a lot of phosphorus, which is essential for the human body. The phosphorus content of chicken breast is second only to seafood. If you decide to cook a chicken breast, it is better before cooking to remove her skins and meat to take home a young chicken, then the broth and chicken breast are delicious. Breast rinse, remove them with sandpaper. Pour into the pan enough water so that it just covered the Breasts, when we put them on to cook. Put the saucepan on the fire, when the water boils, toss the onion, carrots. Cut the celery in large pieces, throw it into the water. Put the pepper – 5-8 pieces, season with salt. Reduce heat and let the vegetables boil. After 10 minutes, drop in boiling chicken Breasts, turn the fire on high and wait until the water boils. After that, the fire abated, so the broth is barely boiling. Throw a Bay leaf. After 15 minutes, turn off the pan and leave the broth to stand for 10 minutes, without removing from the pan cover. Remove the meat, cut it into serving pieces. Broth pour into mugs, sprinkle with chopped herbs and serve with meat. Garnish with chicken Breasts very well as a side dish to use boiled rice and vegetables. 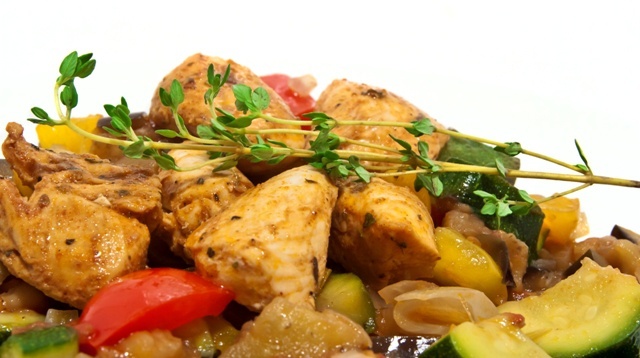 If you are on a diet, the vegetables with a chicken breast can be baked in the oven. For cooking, use of chilled or fresh meat of young chickens, then boiled chicken breast is juicy and tender. 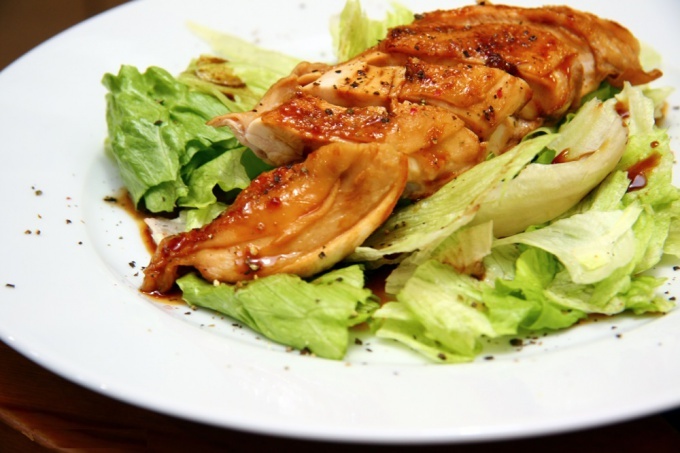 Chicken breast is good to use for salads, seasoning them with a mixture of olive oil, lemon juice and soy sauce. Chicken breast - diet product. However, prepare to love her not many - when roasting a breast is dry and tasteless. To avoid this, you need to follow some rules of cooking chicken breast. Then she stays incredibly juicy and flavorful. If you really want to fry a chicken breast, let it be in the batter. The batter is prepared as follows: mix the bread crumbs with any seasoning and one egg yolk (1 kg smoky Breasts). Leave for 10 minutes to swell, then dip the breast in batter on both sides and fry. Fry without a lid - then it will be delicious crisp and the inside juicy flavorful chicken breast. 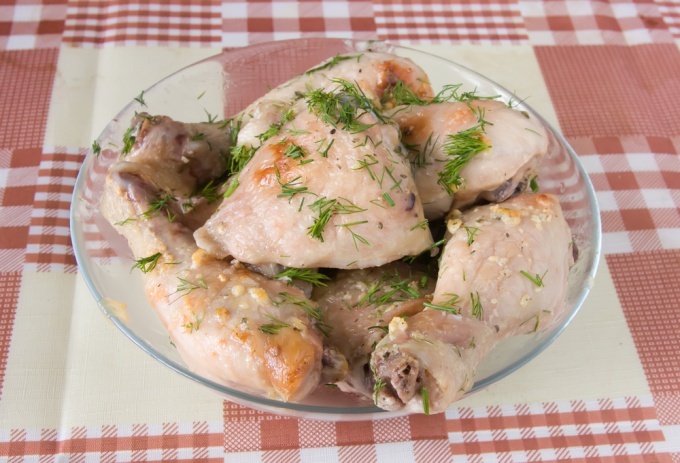 For cooking chicken breast in the oven you will need a bag for baking, 150 g sour cream, dill, garlic. Breast, cut into small (2-4 cm) pieces, put it into a bag for baking, pour sour cream, add chopped garlic and dill, salt - to taste. Tie the bag, puncture it in several places to get out excess steam, and place in a preheated 180 degree oven. 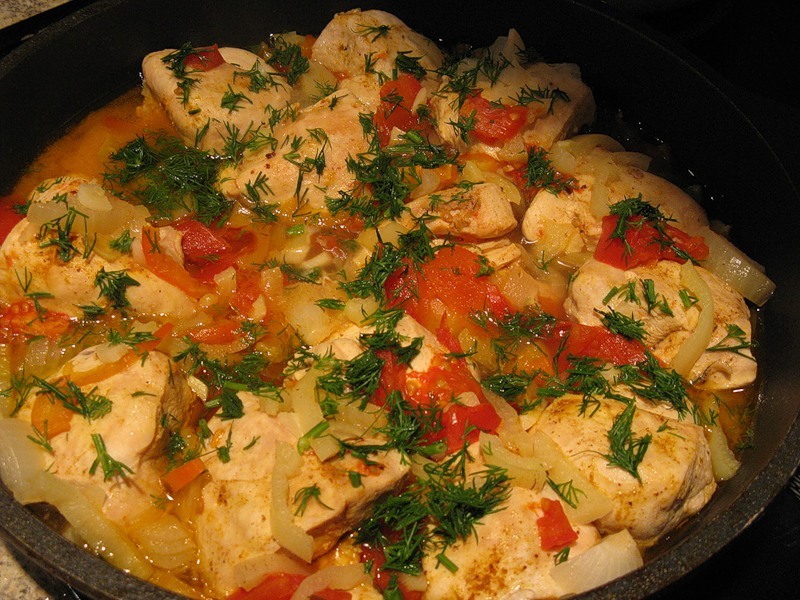 Chicken breast is cooked quickly - after 20-25 minutes the dish can be removed. Chicken breast will retain all their juices, will be very soft. Very tasty and healthy dish. In a large pot with thick walls lay a series - chicken breast (1 kg) 1 small zucchini, 1 eggplant, 1 tomato, 3 potatoes. The chicken should be diced, the vegetables round thin slices. Optionally, you can add a layer of sour cream and tomato sauce. Under a layer of vegetables chicken will be very juicy and soaked appetizing aromas.